Sprays of laurel and oak leaves surround the head of Edward VII, king and emperor, looking so wise and benign in this finely sculptured likeness created, not as one might expect by an artist from the British Empire, but by an Austrian, Emil Fuchs. Here at the highest level, and yet at the most mundane, is an emblem of nationhood, proclaiming a country that – superficially at least – sees itself as cultured, unshakably monarchist, and ultimately pacific. 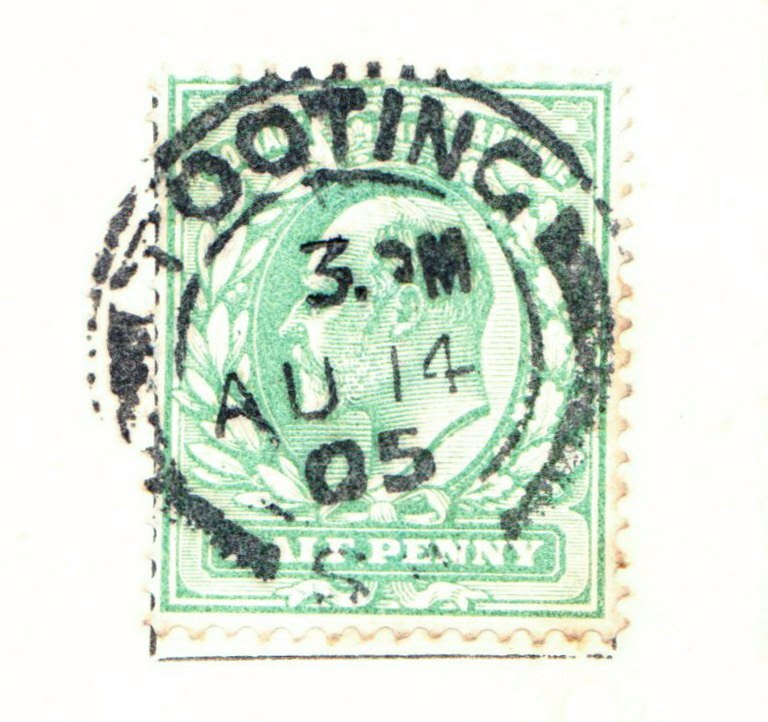 The postmark also contains much interest, for it confirms that this particular card was posted in Tooting, a then relatively new lower-middle-class suburb in south-west London. Coincidentally, in August 1905 the mayor of the Metropolitan Borough of Wandsworth was the Rev. John Hendry Anderson, who was also the Rector of Tooting and notable for his achievement as the chairman of the Works Committee of the Central Unemployed Body for London. That body existed to find short-term work schemes for unemployed men, and in his role Anderson was able to offer a team of some 250 local men to construct an open-air swimming lake on Tooting Bec Common. The pool was opened on 28 July 1906, and in terms of Anderson’s legacy it is a mark of the success of those mens’ labour that Tooting Bec Lido continues to flourish right down to the present day. Here then is an example, I would argue, of how even the smallest pieces of ephemera have the capacity to yield a rich mine of insights into the attitudes and everyday life of Edwardian Britain. Easton, John, British Postage Stamp Design (Faber & Faber, 1943), pp. 12 &160. Smith, Janet, ‘Tooting Bec Lido at 100’ in Wandsworth Historian no. 83 (2006), p. 14. Thomas, Peter, ‘Rev. John Hendry Anderson: Mayor of Wandsworth 1904/05’ in Wandsworth Historian no. 42 (1984), pp. 8-14. Neil Robson is the editor of the Wandsworth Historian, a long-established journal which covers the local history of south-west London. Neil’s particular interest lies in lesser-known novels from the period 1830-1914. This entry was posted in Essays and tagged Edwardian stamps, Edwardian Wandsworth, Emil Fuchs, empire, postage stamps, Tooting, Wandsworth. Bookmark the permalink.